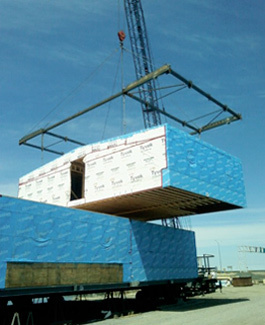 > We produce very large modular units (up to 32 feet wide and 60 feet long), weighing up to 75,000 pounds. 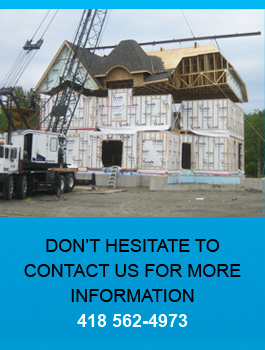 > We offer two-storey units. > The modular units are loaded onto barges or ships at the Port of Matane for transport to your nearest landing site. > We build modular units tailored to your specifications and your specific needs. > Our units are built on steel frames, making them easier to transport. We can also build on wooden frames, within the constraints of transport and installation. > We save you time and money with our fleet of trucks, cranes and other specialized equipment. We even invented a unique trailer system to facilitate moving and setting up the modules. > Our products are delivered ready for use. Before being shipped, each unit is fully assembled and tested (electrical and plumbing systems, etc.). We can even supply furnished units! > Unparalleled installation speed: duplexes installed in 6 days and single-family homes installed in just 3 days. > We offer a turnkey service, including on-site installation and commissioning of the buildings.